Did you vote in Ryerson’s Senate elections this year? What about the Ryerson Students’ Union (RSU) elections? 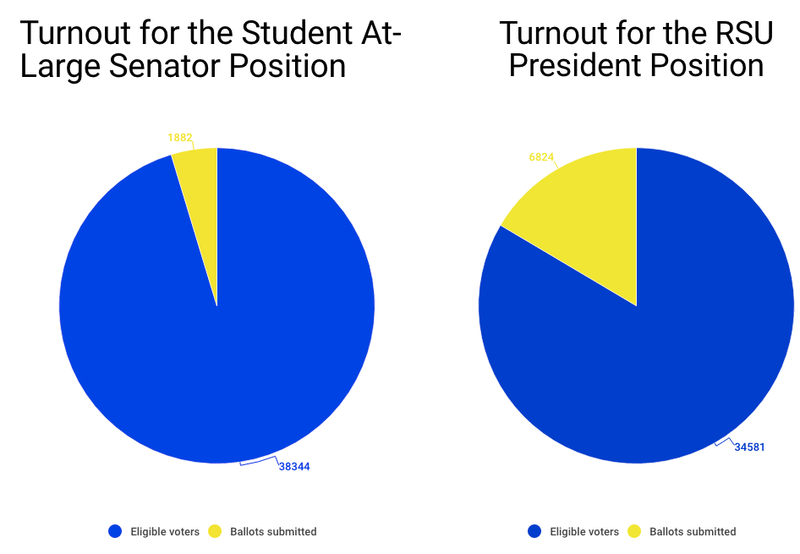 Despite having an eligible voting population of 38,344 students, only 1,882 ballots were submitted for the student senator at-large position. That makes a participation rate of 4.9 per cent. In contrast, voting for RSU president had a participation rate of 19.7 per cent. Carolin Zakee, a third-year aerospace engineering student, said she voted in the RSU election because some of her friends were running. She said if her friends were not candidates, she probably would not have voted. “Every year we vote, and then somehow I don’t see any magnificent change between a year and the others,” Zakee said. Why is there a low turnout for the Senate election? Razi Syed, who was elected as one of four at-large student senators, said that the low turnout didn’t surprise him because students campaigning for Senate positions do not receive any funding. Students running in the RSU elections receive funding from the RSU’s operating budget. Presidential and vice-presidential candidates can spend up to $500 and Directorial and Graduate Representative Committee candidates can spend up to $300, according to this year’s elections nomination package. “That’s a huge difference compared to zero dollars,” Syed said. However, some students did not appreciate the RSU’s budget. Because of the lack of budget for the Senate candidates, Syed said he focused his campaigning efforts on talking to students. He said that almost every student he talked to didn’t know what the Senate was. Salman Faruqi, another newly elected at-large student senator, said the low turnout may have been connected to the amount of elections happening in one short period of time. Still, he said it’s important to him that students know what the Senate is. “We’re representing the students, and if students don’t even know what we’re doing, that’s our biggest failing as student senators,” Faruqi said. Faiz Khan, who ran to represent the Ted Rogers School of Management on the Senate, agreed. “If more people knew about that election … it would make much more of a difference. RSU was out there, it was quite evident that their elections were going on, but with Senate, it was over in a week, and nobody really thought much about it,” Khan said. Khan said another possible contributing factor to the low turnout was that the Senate’s two week campaigning period was cut short by Ryerson’s winter study week. The campaigning period “made no sense.” It meant that “people ending up waiting until they got back to school” to campaign, Khan said. Some students can be quick to complain about Ryerson, Khan said, but “when presented with an opportunity to change it, we only had a four per cent voter turnout. “It just goes to show that people are ready to complain about something, but not able to stand up and make change,” Khan said. If students genuinely believe that no candidate is legitimate, “they [should] consider running themselves,” Lis said. “If the democracy is broken, if there is nobody fit running, then somebody fit needs to run. “At the end of the day, the school is for students and the Senate is an organization that works for students so if people aren’t getting involved, if people aren’t voting for Senate elections, then they’re not getting their voices heard,” Faruqi said.